The proceedings presently consist of between 60-80 articles published in an A4 soft cover volume. The articles contributed are formal written papers, which have been refereed and subsequently revised. All articles have previously been presented at the annual conference. Space limitations apply to the length of the published articles. Distinguished overseas or New Zealand speakers are commissioned to give the Landcorp Farming Limited Lecture and the Living Legend Address on topics of relevance to Animal Production. 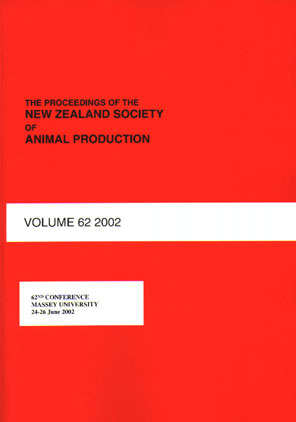 Historically, the proceedings have covered a wide variety of topics and species that are of interest to New Zealand farming. The majority of articles relate to sheep, dairy cattle, beef cattle, deer, goats and horses. Papers on fibre and meat production, growth physiology, genetics, reproduction, lactational physiology and animal health are normally the major subject headings. You can fulltext search all issues, as well as browse articles by year, topic and title, and then link to the required abstract page or full paper in PDF format. The PDF's are only available to society members and a password is required. Non-members can request copies of the full papers by emailing, faxing or writing to the Executive Secretary listing the papers required, along with NZ$10 per paper requested. The Society has produced a 2 CD set containing all of the proceeding since Volume 1 in 1941. Every paper has been converted into a fully searchable file in Adobe PDF format. This has greatly improved the usefulness of the NZSAP Proceedings in that the entire collection can be searched for author, title, keyword or for keywords within the papers text. The first CD contains years 1941 to 1985 and the second CD has years 1986 to present. Each year the second CD is reproduced with the latest volume added, and is made available to those people who have already purchased the CD at a significant discount.